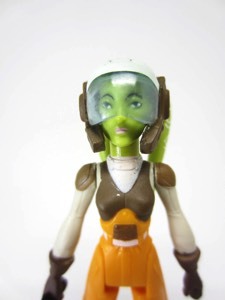 Commentary: We all love Hera Syndulla, the boss on Rebels and - of course - a scarce figure. You might have seen her for a few minutes in March 2015, but probably not. 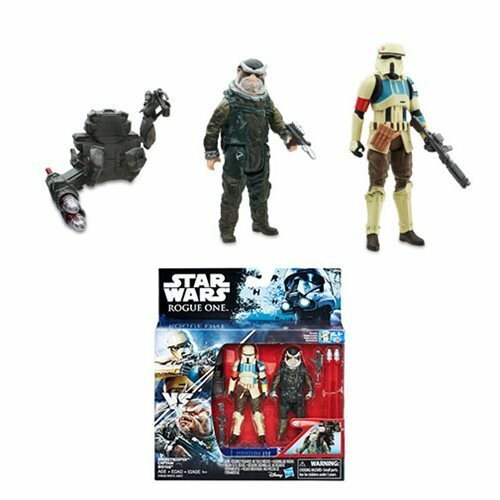 Hasbro didn't exactly overproduce those figures, so other than the ones who shipped in multiple waves or packed with other figures like Kanan and Ezra and the Inquisitor, you probably didn't get a crack at the main crew. For this reason, the new Hera is a mixed blessing. It's basically the 2015 figure, but with a new head. 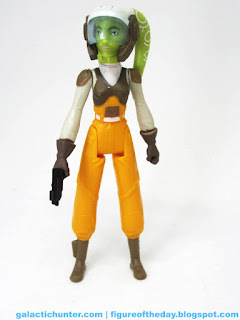 If you got the original Hera from 2015 [FOTD #2,142], you're going to recognize the figure. 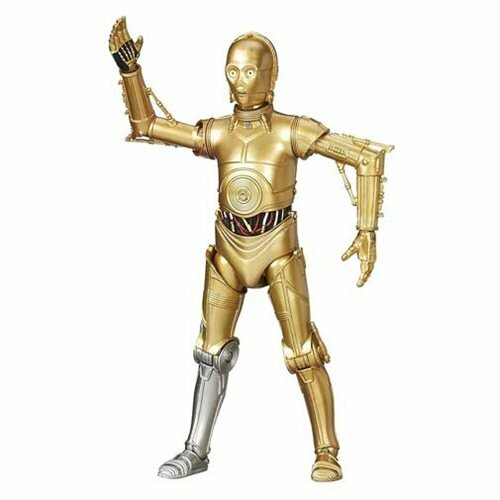 Same body, arms, legs, and blaster. The white straps on her legs remain unpainted, but they're there. The faux holster still can't hold a blaster, but it's there. The design was engineered to sit in a vehicle, which is perfect as Hera will be serving as a pilot on the A-Wing which comes in the box. The main changes are the colors are a little richer, and she has a new head. The helmet is affixed to her face, so you're not going to slide it off. It's a clear visor with more or less the same face underneath. The lekku (head tails) are given painted rings, but they're not as thick as the original figure's. She has no problems holding the blaster, although I should note that unlike the Imperial Speeder there's no box to store it in on board her vessel. It rattles around or stays in her hand. The vehicle, I like. The A-Wing fighter was an early holy grail as a kid, because I am old enough to remember seeing - and not being allowed to buy - the original Kenner Droids one stacked to the ceiling for $6 a pop. Yeah. I got one a few years later for $40, which was pricey, but that was a fantastic vehicle! Rotating canons. Levers controlled the cockpit and landing gear. Battle-alert sound. Fancy. That mold was used for a few more A-Wings you know about - plus a couple that didn't ever make it out, doncha know - but none replicated the smooth functionality of the original. The 2016 version is an all-new mold with fewer - but different - features. Like the concept painting, the notch in the front is filled in and the cannons are a little beefier and not as spread out. The 9 1/2-inch long vehicle is shorter than the original, but it looks like it should be a small vehicle - the pilot doesn't take up all that much space in the cramped cockpit, and this vehicle does seem in line with the smaller size. It has little skids that let it stand on a desk, but no retractable landing gear. The big mechanism is a much-maligned Nerf dart launcher on the bottom with two clips to store extra darts. It shoots quite far - across my house! - and you'll probably not see it looking down at it on a desk or a shelf. I don't see it as an eyesore, but all of you seem to be intent on telling me that I'mw wrong. I think it just works - as does the red and grey deco, plus "nose art" behind the cockpit showing Kanan in a piece of art so small I can't see it. It says "Moonbeam" under him. It's not as detailed as the show, but it's a toy, and it's 2016. It's close, and it comes out of the box almost completely assembled - you just apply 1 sticker and it's done. Mine didn't even have wrappings, you just immediately free it from the box. Is it a good deal? Probably in the sense of what you can get at the toy store, but long-time fans will convulse at paying so much for a smaller toy - figure or no. In 1997, we paid $20 for a larger vehicle with a pilot - but no projectiles. With inflation, that would make it $30 today. The cruel hand of time (plus Chinese labor and manufacturing) makes this a pretty decent deal - a new vehicle with a tweaked figure, rather than a tweaked vehicle with a new figure. I like the Nerf launcher, and I love the vehicle design. It's not for everybody, but it's not like this hobby is, either. If you've got the thousands of figures and hundreds of vehicles, you'll need this. 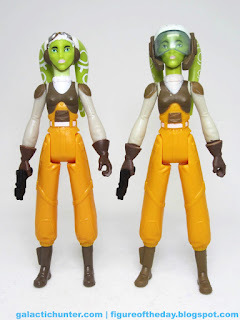 If you love Rebels or just want a Hera or an A-Wing? Awesome. If you want your favorite Rebel ship in the colors of your own personal web site? You're me, and satisfied. 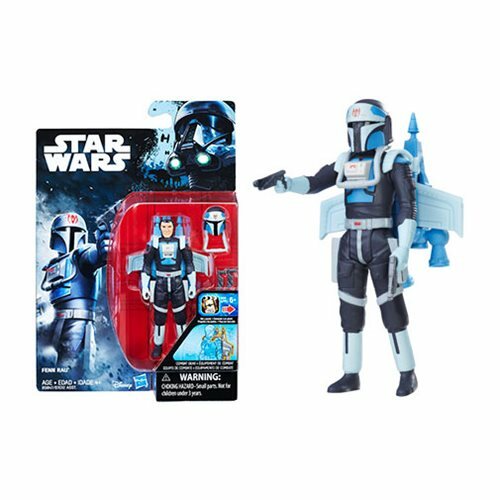 I hope we see a McQuarrie-inspired blue redeco, because that's way more interesting than Hasbro just reboxing it like they did the Imperial Walker, First Order Snowspeeder, Ezra Speeder, Y-Wing Scout, Rey Speeder... am I forgetting any? Do I sound bitter? Because I am. Those should not have been brought back. Go buy yourself an A-Wing.